Working with BBH, Director Mark Jenkinson and Rogue London, The Mill helped to create Audi’s ‘Virtual Cockpit’. 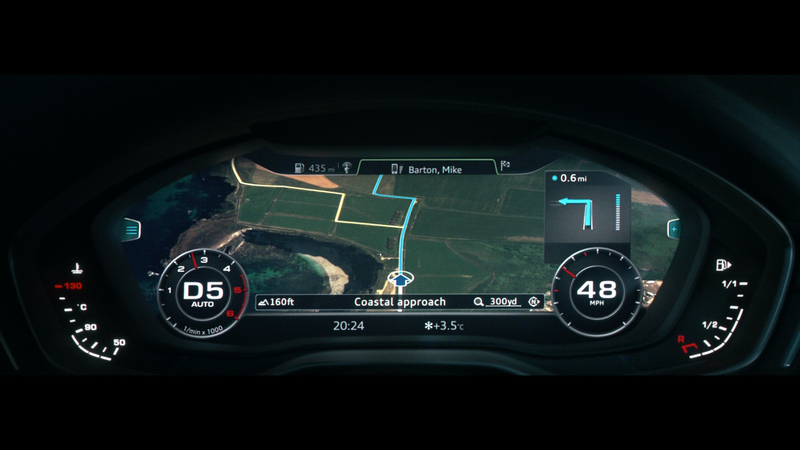 As the title suggests, the 60-second ad places the viewer in the driving seat with the Audi 'Virtual Cockpit’ in full screen; high-contrast, razor-sharp and brilliantly clear, displaying all the information a driver could need. In order to re-inforce the message that ‘Information is Everything’ the spot alternates between scenes of a rescue mission at sea and of being placed inside the cockpit, travelling to a helicopter to embark on the mission; all the while, making and receiving telephone calls and being fed information such as weather conditions, directions, status and route updates via the Virtual Cockpit screen. 2D Lead Artist Pete Hodsman comments; "It was great working with Mark and the creative team on this beautifully shot film. The spot is both dark and moody, so we had to make sure that whilst our animated Virtual Cockpit scenes were perfectly clear, they also had to fit seamlessly with the character of the film. The dashboard was filmed with in-camera light effects to match the same moody look as the film and give the sense of movement and speed. Our design department animated each Virtual Cockpit element in AfterFX, then in Nuke we rebuilt the live action plates incorporating multiple light passes, reflections and renders to find the balance between clarity and darkness."